David Cushley rounds Carrick goalkeeper Brian Neeson to score Ballymena United's second goal in Saturday's Danske Bank Premiership match at the Belfast Loughshore Hotel Arena - but the Sky Blues conceded two late goal as the game finished 2-2. Picture: Press Eye. 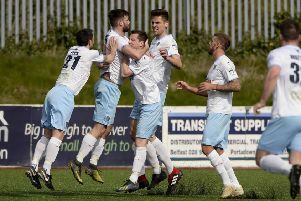 Lee Doherty admitted that Ballymena United should have been able to see out a 2-0 lead in Saturday’s Danske Bank Premiership match at Carrick Rangers. The Sky Blues looked to be heading for back-to-back league wins thanks to David Cushley’s double strike before two late goals saw the Sky Blues pegged back. “We’re disappointed not to have won the game,” said the former Northern Ireland international. I thought it was a game where we were in control for the majority of the 90 minutes. We lost it for a bit of a spell in the middle of the first half but once we went 2-0 up it looked as if there were going to be no other winners than ourselves. Doherty was annoyed at the award of a disputed free kick from which Ryan Kane scored to bring Carrick back into the game. “The free kick from which Carrick scored their first goal was a bit annoying but I’m not going to keep lambasting referees because I’m fed up doing it but it was certainly a decision that I felt wasn’t a foul and it changed the course of the game. “Even the Carrick bench were looking around and laughing at it (the award of the free kick). “Kyle McVey clearly got up, won a header and he might well have had his hand up but your hand goes up anyway when you jump for a header but it certainly wasn’t a push and he didn’t impede the forward. “But we needed to manage that situation better. It happened and we needed to get ourselves focused rather than arguing with the referee. We should win the game but I always look at performance. “I couldn’t fault the players for their effort on a sticky pitch, they gave everything they had but we could have managed ourselves better in front of goal - if Willie Faulkner had showed a wee bit more composure he might have finished the game off - but it was a game that I just didn’t see us not getting three points out of,” added Doherty.